In this paper we will discuss a single sideband amateur radio transmitter/receiver for the 40 meter band that has been designed to ensure good performance characteristics with reasonable number of parts (no “overkill” in component use), particularly concerning the receiver. Circuit simplicity and over-average performance were to be combined. The background: Some years ago I had built the ancestor of this transceiver and afterwards posted an incomplete series of articles (starting here). The transmitter was considered to be quite OK (I could even work a station from South Korea when operating as GJ/DK7IH some years ago) but the receiver was weak. The shortcomings originated from the rf preamplifier I used together with the 1st mixer, an NE602. The latter had severe problems to cope with the high signal levels on the 40 meter band from out-of-band broadcast stations transmitting on the 41m band (f>7200kHz) or from very strong amateur stations transmitting in-band. This is caused by the technical specs of this Gilbert cell mixer. NE602 has been designed for mobile phone applications and not for shortwave radios. Its IMD 3 is only -15dBm whereas it is able to detect weak signals (-119dBm with an S/N ratio of 12 dB) according to datasheet. Due to this NE602 was excluded from being used at least in the receiver. Another point was that the rig was too small and too densely packed to be called “service friendly”. Thus I dismantled the radio some times afterwards and had in mind rebuilding it with another receiver and a little bit more space inside. Receiver: Single conversion superhet, 9 MHz interfrequency with commercial filter (supplied by http://box73.de) shared by transmitter and receiver and relay switched, “NE 602-free zone” ;-), 4 dual gate MOSFETs in rf preamp, rx mixer, if amplifier and product detector, audio stages with BC547 as preamp and LM386 as main audio amplifier. Edit: I found that there was strong signal of self-reception around 7.100kHz which was not a spurious signal from one of the DDS. It has been a mixing product of one or two oscillators together with a signal from the microcontroller. So I changed the interfrequency to 10.7MHz which cured the problem. I tried to calculate the issue but was not succcesful because I do not know all the frequencies in the microcontroller. I think it is most probable that it is a harmonic of the PWM signal I use for controlling the LED front lights. Transmitter: 4 stages, 3 of them in push-pull mode, Siemens made mixer IC S042P (really old fashioned, but still available) as DSB generator and TX mixer, rf amplifiers (2N2219A) after filter and tx mixer. Design: Really “cool” with blue backlight. Sandwich built, not the size of a “micro transceiver”, but handy for travelling. The basic outline of the radio is standard and should not be further discussed. The source code has got about 2200 lines. With the GNU C compiler this leads to a HEX-file of about 43kB. Because of this the controller had to have a little bit of more memory. A “644” is a good choice here. It is clocked internally to 8 MHz clock rate. Radio and user data (user operated keys, S-Meter, TX PWR meter, temperature sensors attached to final transistors) is lead to the analog-digital-converter (ADC) of the MCU. Rotary encoder (optical) is fed into digital inputs. Integration of an RTC is projected but not done yet. Here an AD9834 is used. It is overclocked with 110MHz clock rate. For my receiver with a DDS chip purchased from Mouser this works without any abnormality. With a a chip from the “free market” (ebay) I found that there were strange clicks in the signal. So, I do not really recommend overclocking under any circumstance and/or not to such a high degree. This DDS is is not terminated with a low pass filter. Due to the high clock rate there is no clock oscillator feedthrough which is supported by the design of the following amplifier having an audio frequency transistor in the last stage (BC547 and later BCY59) that limits high frequency components due to its early gain decay in the frequency spectrum. The two stage amplifier has been designed for excellent linearity to prevent impurities in output spectrum. The first peak showing the 16MHz signal and the next peak is the first harmonic about 30dB below. Other peaks are from local sources (PC, Printer). This one contains an AD9835 synthesizer clocked to 50 MHz. An LPF here is mandatory. A simple but linear amplifier brings the signal up to 3Vpp which is OK for driving the dual gate MOSFET in the receiver. For the transmitter mixers this amount of voltage is too high, small capacitors reduce the voltage to an acceptable value. From another project that I once had built and that is not more in use, a dive computer, I had a 4 lines/20 characters text display that is fairly large. This was to be designated as the LCD for this transceiver. Building a receiver for the 7MHz amateur band is challenging. On one hand the circuit should be very sensitive for weak signal reception, particularly during day when the band conditions are low due to solar radiation and density of the D-layer. This means the receiver should have a higher gain whereas noise figure does not play a predominant role due to band characteristics with high atmospheric noise on 7MHz. Next request is high dynamic range to eliminate the spurious signals that occur when front end stages are loaded with high input signal levels. And last but not least AGC control range should be as wide as possible to cope with weak and very strong signals without the request to intervene by adapting manual gain control. For this a preamp also benefits. Active mixers like the NE602 show low performance under these conditions. Some high-current mixers like the SL6440 exist, but there are alternatives. On one hand the classical diode ring mixer might come into perspective, otherwise Dual-Gate MOSFETs are well known as having a fairly good ability to cope with high signal levels and so don’t tend to deteriorating the receiver’s performance severely. Besides they offer some gain and low noise figure (which has not been the main objective in this case) and the circuit is very compact and therefore it was the best choice for a receiver that had been intended to be constructed onto a board of 6 x 8 centimeters. After these thoughts the following circuit turned out to be the right onset for a receiver inside the projected rig. On the left we start with a 2 pole LC band pass filter for 7 MHz. The coils are wound on TOKO style coil formers (5.5mm size), winding data and parallel capacitors are given in the drawing. The coupling capacitor (2.7pF) between the two LC circuits is very small for such a low frequency. This makes the filter response curve sharper but leads to a slight weakening of the signal coming through the filter. But as the whole receiver has plenty of gain and a very good noise figure, this is the reason why some weakening of the input signal is acceptable. Next is the preamplifier for the received band. It is connected to the AGC chain. You can expect some 25 to 30dB gain swing by driving up gate 2 of the dual gate MOSFET from 0 V to 6V. A 1:1 voltage divider decrease the 0..12V AGC voltage to 0..6 V where th3N205 MOSFET is close to amplify with maximum gain. Exceeding 6 to 7 volts does not result in significant more gain swing, so I usually drive the MOSFET from 0 to 6.5 volts UG2 (with 13 Volts of supplied voltage. The coupling when going from the preamplifier to the receiver mixer is in broadband style. The 3N205 has a very high gain and tends to self-oscillate. A second LC circuit makes the device more prone to going self-resonant and hence produce unwanted signals. which is a commercial one (Supplier box.73.de). The reason why I don’t ladder filters anymore is that I found it extremely difficult (not to say impossible) to get a symmetric filter response curve thus making the lower and upper sideband of the receiver sounding different even when the carrier frequency has been adjusted very thoroughly. The filter is used for the SSB transmitter as well. To ensure maximum signal separation between the two branches (tx and rx) and between filter input and output I again us a high quality rf relay made by Teledyne. When choosing a relay intercontact capacitance is crucial. It should (if possible) be < 1 pF. Don’t forget a clamp diode to VDD over the relay coil to eliminate high voltage voltage peaks generated by self inductance when the coil is switched off. Voltages up to 100 Volts can occur. This might damage the transmit-receive section of this transceiver that is equipped with semiconductors only and does not use a relay. This circuit is the same like that of the rf preamp. It also is part of the AGC chain, thus delivering another 25 to 30 dBs of gain swing so that overall gain swing is around 50 to 60dB. In practical research over a long period of observation I found that with an antenna delivering high signal voltage (Delta loop) it was not possible to overdrive the receiver to a level where signal distortion was audible. A tuned circuit is also placed here to increase gain. Tuned amplifiers usually have higher gain than broadband ones. It is highly recommended to ground the metal cans of the coil to prevent any self-oscillation. But as I found out, this amplifier is not very prone to go to self-oscillation state. Here again a dual gate MOSFET is used. The circuit is nearly the same like the RX mixer except from the output section. We can see a low pass filter here, consisting of 2 Cs (0.1uF) and a resistor (1k). You can use a radio frequency choke instead, 1mH is recommended. This section consists of two parts, a preamp (with bipolar BC547) and a final amplifier (LM386 IC). It is well-known that this IC tends to oscillate. One measure to prevent this is to keep leads short, switch a low-pass filter (capacitor 100uF and R=33Ω) into the VDD line and to reduce the gain capacitor between pins 1 and 8 to a degree where self-oscillations terminate. This is another re-use of a circuit I have frequently used before. It is desired to reduce its output voltage down to 0 volts when a more or less strong af signals appear at the input. The agc voltage is derived from the audio signal of the receiver. Some say that this is not the best choice because you need more time (an af cycle last much longer as an rf cycle) for the waveform to generate the regulating DC voltage. Nonetheless I have never observed popping or unpleasant noise from incoming very strong signals. The agc response rate is so fast that you won’t notice that it just has regulated even when a strong signal comes in. Only with very, very strong signals a slight “plopp” sound is observable but it is not unpleasant. A second capacitor can be switched in parallel to the 33uF one. This can either be done by a transistor switch (like shown in the schematic) that in this case is controlled by an output PIN of the MCU. An alternative that I found later is to use the MCU pin directly to switch the cap. When not using the additional cap you must switch the pin as an input so that there is no positive voltage from the pin to the circuit. When you intend to ground the transistor (agc in “slow” position) then the pin mus be set as output by defining the DDR-register respectively AND the pin must be set to 0. So you can get rid of the switching transistor. Another possibility would be to derive the agc from the interfrequency signal. The problem that occurs in this case is that you have to decouple the local oscillator (bfo) very carefully from the place where agc circuit is placed. Otherwise you are at risk to detect the bfo signal by the agc which leads to reduced response range in the agc. In addition this receiver uses a higher rf voltage level for the mixers (2 to 3 Vpp each). By this the amount of stray energy is higher inside the circuit and thus this rf energy might be detected very early by the agc. In the emitter line there is a resistor (68Ω) which produces a voltage drop when the transistor is driven. This is fed into the ADC of the microcontroller driving the S-meter display part. This amplifier is a simple common-emitter circuit with the directly grounded emitter of the BC547 transistor. This circuit is linear only for low input voltages but suitable for the connected dynamic microphone since this does not produce more than some millivolts of audio energy. Bias comes from the 390kΩ resistor. At the input you find a 2.2nF capacitor from base to GND which helps to prevent coupling in rf energy from the transmitter to the audio stage and thus leading to an impure signal. The amplified microphone signal is used to produce a double-sideband signal. The ic I use here is an antique but still available part by German manufacturer Siemens, the S042P. It includes a so-called “Gilbert-cell” mixer and an oscillator but the latter is not used here (Datasheet Application note (in German)). The S042P mixer needs some more components compared to the well-known NE602 integrated circuit but fewer ones than the MC1496. It is designed for 12V usage, thus no voltage regulation is required.The ic can be applied in balanced mode or non-symmetrical. To save components I use the unbalanced circuit alternative. A slight loss in output power is acceptable in this case, there are amplifiers post each mixer in this transmitter. Ic gain is about 16.5 dB, DC current is about 3 mA. A crucial point is the signal level of the local oscillator. S042P needs only some hundred millivolts of oscillator voltage. To prevent overdriving I experimented with different values of the coupling capacitor. 5.6pF seemed best because the LO produces some volts peak-to-peak. i) The first measure goes along with the 2.7kΩ resistor between collector and base of the transistor. This resistor provides positive dc bias voltage to the base and leads 90° out-of-phase ac voltage to the transistor’s input. This reduces gain and therefore distortion. But due to the fact that the whole transmitter strip has plenty of gain, this loss in gain is not a serious problem. ii) The 10Ω resistor in the emmitter line is not bypassed by a capacitor. This stabilizes the circuit. When the current through transistor increases the emmitter voltage will rise (according to Ohm’s law) and the voltage between collector and emmitter drops. This reduces voltage difference between base and emmitter and hence also reduces gain. The coupling to the next stage is done by a capacitor of 0.1uF. This causes some impedance mismatch. But that is as well not a big problem because the gain reduction here helps to prevent the whole transmitter from unwanted oscillations by diminishing overall gain. Here the second S042P is used. The 9 MHz SSB signal is coupled to pin 13 of the ic, a DC connection is established to pin 11. These two pins represent the base connectors for the two current control transistors and should be bridged by a DC resistor in this circuit. The 150Ω resistor from pin 10 and pin 12 to GND defines the gain of the mixer. Here you can use down to 150Ω but should have a resistor towards VDD to limit current and avoid excessive heating of the device. In this case another 150Ω is used. VFO signal is coupled symmetrically to pins 7 and 8 via a small trifilar toroid. See schematic for details and please note that center tap is not used here. This is in contrast to the output transformer where the tap is used to feed supply voltage into the mixer. Another 7 MHz band pass filter terminates the mixer, data for coils and capacitors is in the schematic. The first of the 4 power stages is the same as the post dsb generator amplifier so there is not more to add concerning this stage. Rf energy is taken out via a transformer with a primary and a tapped secondary winding. This is to provide the balanced structure necessary for the following push-pull stage. This is the first push-pull stage. Its bias is derived from a voltage divider connected to the tap of the input transformer. Please note: In contrary to the schematic I have installed 2 devices of the 2SC1973 type because the signal turned out to be much purer with these ones on the spectrum analyzer. A tapped output transformer feeds the amplified rf energy to next board. Output impedance is 50Ω. The coupling to next stage then is done via a shielded cable of (nearly) the same impedance. This one has an input transformer also center tapped. The tap goes to a bias network consisting of a current limiting resistor (1kΩ), two diodes forming the lower part of a voltage divider and some capacitors as part of a low pass filter to avoid coupling in of radio frequency (rf) energy. The two diodes must be thermally connected to the cases of the transistors. In case these heat up, the diode increases its conductivity thus reducing its resistance. The bias voltage drops and heating is stopped. So, thermal runaway is prevented. For these two stages (predriver and driver) DC is fed through low pass filter (RFC and 2 caps 0.1uF) to prevent coupling of rf energy via the VDD line. This stage receives input from a balanced structure without a center fed transformer. Instead bias current is linked in via a network of radio frequency chokes and two resistors of 5.1Ω each. Bias is provided by a current regulating transistor and should be set to about 100mA. With this I could have been able to remove the precious transistors without having to unsolder them when the device might have turned out to be a failure. But it was not, thank God! The output transformer is the one I have used in my old 14MHz PA and the ancestor of this radio. It is from an old ATLAS 215 transceiver and I hope that this will be the final place for the transformer. For the low pass filter I use 2 toroids T50-2. These might appear small but from one source (that I have forgotten) I remember to have found that for 50 watts of power this core is still suffice. Metal powder cores can stand much more power compared with same sized ferrite toroids. The power measurement unit consists of a network that starts with a resistor of 12kΩ to ensure a significant voltage drop in signal level, then two rectifier diodes (1N1418 or equivalent) follow, some low pass filtering eliminating the last rf energy and the resulting direct current voltage is fed to a variable resistor to set an adequate voltage level for the ADC in the microcontroller. A very simple circuit. Two PNP power transistors are used but they don’t have that much to do. They are only designed for switching the low-power parts of the radio. The high current to the drivers and final amplifiers is permanently present in the collector lines but the bias lines are tx/rx-switched and go to 0V during receive periods. This reduces requirements for the power rating of the switch board. 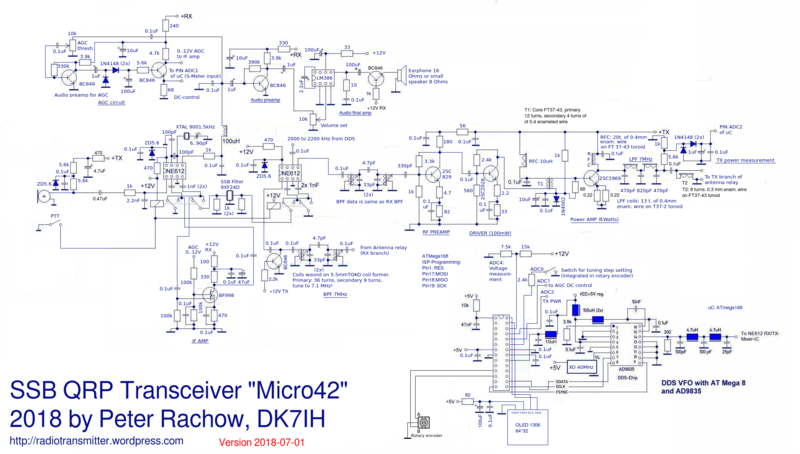 DK7IH QRO SSB transceiver for 7MHz/40m – RX/TX switch board. When pushing the PTT the base of the lower transistor is pulled to GND. So it becomes conductive and TX DC is applied. Via the diode the upper transistor loses its negative voltage and becomes non-conductive. One interesting thing was the blue backlight to illuminate the front panel controls. It is made using SMD LEDs that are soldered to small pieces of Veroboard and fixed with 2-component glue to transparent light-scattering plastic bought from a local supplier for architects and designers. This material is used for making models of houses and stuff like that. As light distributor this material is excellent. The LEDs are powered by a linear transistor connected to the pulse width modulation (PWM) output of the microcontroller so that light intensity is adjustable. Hint: When programming the PWM functions it might occur that PWM frequency is audible in the receiver. If something like that occurs another frequency can be selected without changing the performance as soon as it is high enough that human eyes aren’t able to recognize a flickering. The covers used for the labels and the LCD shield are made from 2mm acrylic and fixed with screws of 1.6 respective 2mm diameter. This is a sandwich construction again. On the first side there is the DDS board (left), the receiver (center) TX mixer and preamplifier (right) and the SSB generator (back). Also there is a 5 lead connector holding the 5 ISP lines (MOSI, MISO, CLK, RESET and GND). This makes firmware updates easy because you don’t have to open the case when you want to update software. 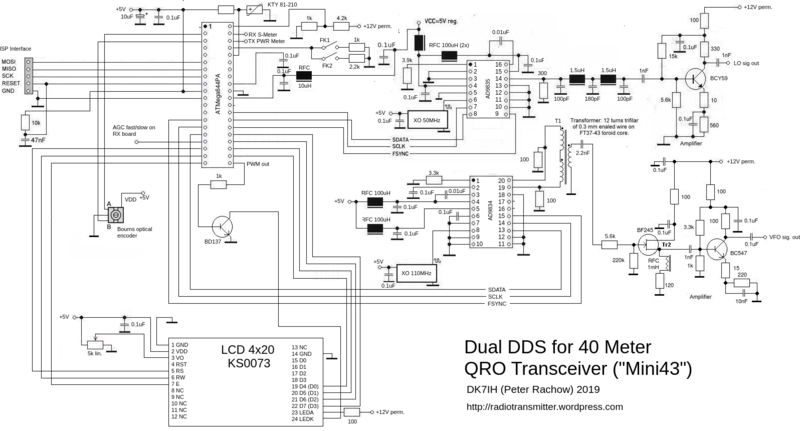 DK7IH QRO SSB transceiver for 7MHz/40m – TX LPF, PA, Drivers, RX/TX switch board. Again big fun this transceiver! During the ARRL DX contest last weekend I could work some statesiders. With Delta Loop and 50 watts, fairly OK. Working Europe all day is no problem with 50 watts. During the first QSOs I had reports that the audio sounded clear but somehow “narrow”. I had used an electret mike that time and could not use a dynamic one because the preamplifier following the microphone did not have enough gain. Then, to solve this problem, I decided to do a full reconstruction of the SSB generator board. The one then had used had an AN612 mixer integrated circuit (from an old CB radio). This one was dismantled and replaced by the S042P board. The change took me 3 hours to develop and solder but it paid. I use a Motorola dynamic microphone now that has a very rich and clean sound. I monitored it on a web based SDR receiver, made a recording and found it to be OK.
OK, dear fellow hams, that’s the story so far, some supplements will sure be made, so stay tuned! Hi again! This project directly “beams” you back to the “Good ol’ 80s” when there was no stuff like “DDS, “OLED” or even “SDR” or other modern technology we today use to build our radios. I designed this transceiver using the “old school” techniques because in a German QRP forum on the internet some hams originated a “Back to the roots”-movement which I thought was a great idea. So I too went back in time 3 decades and constructed a radio like I did it in the eighties at the beginning of my “homebrew career”. That meant: No digital stuff, just a simple VFO but (and that is new) higher rf output power because condx are fairly low on the hf bands currently. I later presented this radio at an annual German convention of homebrewing hams called the “Black Forest Meeting” named by the place where it is held the beginning of October each year. To give you an impression, that’s how the radio looks from the outside. Pretty “old school”, isn’t it? No “save as many components as possible”-design. phase noise performance usually is better than most of the digital ways to generate a signal. For the VFO I chose the Hartley design characterized by a tapped coil. This type uses less critical components than a comparable Colpitts circuit thus reducing number of parts (2 caps in this case that are avoided) which might lead to unwanted frequency changes (drift). Lots of pages have been written about this topic. This another one. First, be aware of the fact that it is not possible to build a VFO that has the same frequency stability like a modern digital system. This is because these systems are all crystal controlled. But it is possible to achieve a drift of some dozen Hertz within an hour or so which is absolutely sufficient for having even a longer QSO. The main problem is based on physics, or thermodynamics to say more exactly. All material expands when heated and contracts when ambient temperature decreases. OK, some exceptions exist, water below 4°C is the commonly known example of them. Heat is the problem in such a circuit. It comes from the interior of the components when current flows through them and from the outside, for example when the transceiver is exposed to sunlight or placed near another source of thermal energy. Also heating of the final rf amplifier stages may contribute to heating the cabinet inside. The electronic parts forming the central strucure of the tuned circuit exert the main influence connected to thermal runaway of the frequency that is generated. The general approach is: When we can’t avoid physical effects we must choose components that change their values in such a way to compensate the changing of the values of the other parts. That means we have to look carefully on temperature coefficients of the varoius components we intend to build into our VFO. Choosing advantageous components is crucial for frequency stability. So I did some brief research to find out more about temperature coefficients of coils of various types and available capacitors. Here are some of the outcomes. Explanation of syntax: If a relation is negative, a minus sign (“-“) is given. In this case the value (C or L) decreases when temperaure increases. A plus sign (“+”) indicates a positive coefficient. When the relation of value change by temperature change is weak (that means no intense changing of the value when heated), there is only one “-“-sign. The more “-“-signs you have, the higher this respective ratio is. The same applies for “+”-signs to indicate a positive relation. Based on this short survey, the best combination would be NP0- and Polystyrene caps together with an inductor wound on an T50-6 (yellow) core. Hopefully their temperature behavoiur will compensate more or less and lead to best stability. Hint: On the photos appearing later in this text you will see an air coil wound on a TOKO style coil former that has been used because it does not need so much space. Starting from the left you can see the tapped coil (here 60 turns tapped at 10 turns from the bottom end) on a 5.5 mm TOKO style coil former without any core. In parallel there are various capacitors (polystyrene and NP0 mixed) to build up the total capcity. It is common use to spread the total capacity needed to various single capacitors because it has turned out that the effects of temperature change are less significant if you use more (and therefore smaller) single capacitors. A 100k resistor is used to pull the gate to ground and therefore provides a correct bias at the FET’s gate. The 1N914 diode is a so called “clamp” diode that has been installed to stabilize (and therefore reduce) the rf voltage in order to avoid excessive rf voltage coming to the FET’S gate which would lead to distortion. This diode has a negative side effect, but that an be accepeted for a VFO in the rf bands: It slightly increases phase noise because it works as a regulator. With some the designs you can see this diode in reverse position, don’t worry, the regulating effect takes place either. To ensure the oscillator to produce radio waves, in-phase feedback between gate and source is generated via the tap you can see with the coil. A tap of about 1/6 of the whole number of windings provides enough feedback voltage to let the oscillator start by its inherent thermal noise and generate clear sine waves afterwards. Putting the tap too close to the “hot end” will cause distortion because the amount of energy coupled back to the gate will be too high. Also instabilites are probable because of excessive drive power to the gate of the FET. On top of the tuned circuit there is a varactor diode that is used to be controlled by a positive voltage to form a RIT (receiver independend tuning) control circuit. It is very loosely coupled to the tuned circuit to minimze temperature effects and because only 1 or 2 kHz “swing” is needed. The generation of the RIT voltage will be described later in this text. The second stage with another FET is very loosely coupled to the source of the first FET. This is made to minimize effects of load changes to the frequency. This stage is a so called “source follower” giving a very low impedance signal to the final stage that is responsible for the amplification of the signal to a level of 2 to 3 volts pp which you will need for the rx mixer that has been designed as a dual-gate-MOSFET mixer (see receiver chapter later!). Voltage stabilization is crucial for best performance of this critical part of the radio. Supply voltage changes always lead to frequency changes. So a two-level buffering is common use here. The first (and most critical) stage is buffered twice (10V voltage regulator integrated circuit 78L10 and subsequently by a 6.2V zener diode) whereas the buffer and the amplifier stages are supplied with 10V regulated DC voltage only. To avoid the VFO being affected by interior thermal convection (flow of warm air inside the cabinet) it is recommended to shield the VFO from the rest of the transceiver. I do not recommend using metal sheets as walls here because these form other unwanted capacities that will lead to thermal effects on the generated frequency. Metal also is a good conductor for thermal energy, so you might run counter to your goals. My thermal insulation therefore is made of simple cardboard. This oscillator is much more uncritical than the VFO because it is crystal controlled. The purpose of the LO is to supply a carrier signal for the SSB modulator. Due to the fact that there are two sidebands we theoretically can use this LO must be switched to either one of two possible frequencies. In case of an interfrequency of 9MHz (9000kHz) these are: 9001.5 kHz for the first sideband and 8998.5 kHz for the second sideband. Please note that I did not write “USB” or “LSB” because the frequencies forming each sideband might be changed because of the frequency plan of the transceiver where by mixing with the VFO frequency the sideband might be inverted depending on if you add or substract the VFO frequency from the 9MHz-SSB signal. using a variabale capacitor or a coil to “pull” one crystal to the desiered frequency. This method means high effort but surely is the most exact one because there are no influences of the unneeded choice to the other crystal currently on duty. Is the worst idea because the unswitched crystal is highly prone to influence the freqeuncy of the switched one because they are linked to parasetic capacities within the wiring, the switch and so on. Forget this one espacially when using the internal oscillator of a NE602/SA612! This to my point of view is the best compromise between circuit simplicity and function. You can see this way of sideband switching in my transceiver. It is a simple Colpitts circuit where in-phase feedback and feedback voltage control are achieved by a series of two identical capacitors. A simple switch, a capacitor (90pF max.) and a coil (4 to 8uH max.) that are either connected to the base of the transistor via the 9MHz crystal determine the sidband freqeuncy of the oscillator. Signal is taken out via the collector. This stage is connected to the antenna relay. It provides an amount of basic amplification for the antenna signals. But that is not the main purpose. Noise figure improves significantly if you use a stage with low inherent noise. Thus a dual-.gate MOSFET is installed here. This semiconductor is also used to control stage gain because gate 2 of the MOSFET is connected to the AGC chain of the transceiver. About 12 dB gain swing are possible here. Stage gain is about 15dB. Note the position of the primary and secondary windings of the input and the output coil. To avoid self-oscillation the output (drain) of the MOSFET is connected to the untuned part of the LC circuit. Coils must be shielded and should be equipped with ferrite heads (in the photo the piece in left bottom corner). In this stage also a dual-gate MOSFET is used. This type of mixers provides good capabilities to cope with high signal levels without producing unwanted signals (high IMD3), gives some dB of gain and is low-noise also. One “disadvantage”, if you want to say so, is that it needs a little bit of higher VFO drive (about 2 to 3 volts pp). Gate 2 bias is generated via the voltage drop on the source line. The tuned circuit in drain line is adjusted to the desired interfrequency. See the schematic for the exact winding data and parallel capacitor. Transmitter and receiver share the same SSB filter in this transceiver. So some sort of switching is recommended even if circuits exist that go without one. I used a high quality relay made by Teledyne that I bought in a 10-piece bundle for low price (1€ each!) via a well-known internet marketplace. Caution: Some SMD-relay I tested prior to building this rig were disastrous concerning signal isolation between terminals. To avoid any disappointment or frustration I recommend testing a relay before you finally install it. All connections to the rest of the circuit must be made with shielded cable. I found an interesting alternative: I sometimes design my own very thin shielded “cable” with brass tubing (1 mm inside diameter) where I put insulated cable inside. The brass tube is connected to GND on the Veroboard. You can not bend these tubes but longer lines can be interrupted for a short piece so that the “bend” can be made by putting two parts of tubing in 90° degree angle for example. This one might look familiar to you. It is a simple “remake” of the front-end stage. The one remarkable thing is the secondary of the output transformer. This coil has 4 windings (prim. 16 turns). The secondary is center tapped (2 + 2 turns). This is because the product detector (SSB demodulator) has a symmetric input. Very important in this stage is the 100uF capacitor in VDD line. This cap prevents the stage from AF resonating and self-oscillations on the VDD line and makes the receiver much more “quiet”. You won’t be able to buy large amounts of this IC anymore. And if you get one, the prices are close to or beyond a rip-off. But there is an alternative. You can build your own “IC”. Watch this page where all the information you need is provided! Signal input goes to the paired transistors forming the amplifier stages. LO is fed into the line transistor that is used to set the current of the differential amplifier thus providing a switching and therefore superposition of the two signals. 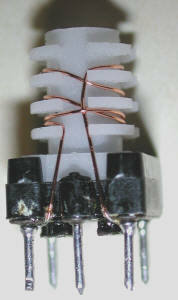 The output circuit is made of an audio transformer formerly used in the final audio amp of old AM radios (coil resistance is about 300Ω each side). The 2.2nF capacitors eliminate remainders of the rf signals and “ground” the terminals of the AF transformer. This final receiver part consists of two stages: An audio preamplifier with a bipolar transistor and a final amp with a TBA820M integrated circuit. The two caps 0.22 and 0.1uF determine how the higher frequency components in the audio signal are cut off. The higher the total value the more the higher frequency components of the audio signal will be limited due to the equation XC=1/(2*PI*f*C). Tr1, which is a universal purpose NPN transistor, provides high gain. Thus a 10k resistor is installed to form a voltage divider with the audio gain potentiometer. In the final stage I use a TBA820M ic (8-pin DIL version). This one is more linear than the well-known LM386 that you usually can find in this place and it is not so prone to self-oscillation. The cap aside the 100uF in the top left corner of the schematic is not marked, its value is 0.1uF. Due to the very high gain of the product detector this stage is directly connected to this circuit and not to the AF preamp. A potentiometer is used to set the threshold of the AGC onset. Next stage is a simple audio preamplifier followed by a “Greinacher Circuit” serving as voltage doubler and providing DC voltage proportional to the audio signal level. A dc amplifier with another NPN transistor lets its collector voltage drop as soon as it is fed with significant dc input voltage. Thus this voltage decreases and so it can be used to control gate 2 of the MOSFETs in the various receiver stages that are equipped with tetrodes. The S-Meter is connected to the emmitter of the final transistor. If conductivity in the transistor rises, the emmitter becomes more positive and the S-Meter needle is deflected proportionally. The 220Ω potentiometer in the emmitter line must be set in accordance to the respective S-Meter you are using. One shortcoming should be mentioned: If you have a not so sensitive meter then the value of the pot can be set to nearly 100Ω or above. This will prevent the collector from dropping to nearly 0V in case there is a strong signal and hence reduce the maximum dB you can get from the AGC chain. The transmitter section is designed for an output level of about 20 watts and uses 4 stages all equipped with bipolar transistors. The last stage is a push-pull stage, the 3 low-power stages are single ended. I prefer push-pull for the last stage (if possible) because this circuit inherently does not create even harmonics thus simplifying output filtering. The mic amp is simple but provides enough gain and good linearity for using an old-style dynamic microphone. It works in common emmitter mode and has gain of about 15 to 20 dB. The audio signal amplified by the microphone amplifier is fed into PIN1 (Input 1) of an NE602/SA612 mixer IC which is the simpliest way to generate a DSB signal with a Gilbert cell. LO input is fed to PIN7 and should be in the range of 200 to 300mVpp. Thus a 12pF cap has been installed to limit LO voltage going to input at PIN7. Carrier suppression is around 45dB when LO offset frequency is correctly set for each of the two sidebands and LO voltage is not much higher than the 300mVpp mentioned before. The DSB signal produced by this mixer goes on to the SSB filter relay and filter that has been described before. The use of shielded cable is mandatory, too. You won’t be able to recognize many differences if you compare this TX mixer to the DSB generator. In fact, there are none. Next is the band pass filter that consists of 2 coupled tuned LC circuits for 14MHz. They are also wound on TOKO style coil formers. Data can be found in the schematic underneath. It is important to also install the ferrite heads that are provided with most of the coil formers and to use the shield “metal cans” that are also standard for these coils. This is to prevent stray coupling of rf energy into the first stage of the power amplifier strip and therefore preventing self-oscillation of the transmitter strip. For proper adjustment set the transmit frequency to about half of the frequency swing ((i. e. to about 14.200 kHz) and tune for max. output. If you modulate with a two-tone signal to the mic amp you should see about 500mVpp by the output of the BPF when the chain is fully driven. We start with the low power end of the power transmitter section. A bipolar rf type transistor is the center part of this stage. This stage is somehow a copy of the stage before but allows more current to flow through the stage. It is also operated in class “A” mode and uses the same methods to maximize linearity like the preamp stage. You can use a 2N3866 transistor here which is available. But any other rf power transistor for driver stages (2SC1973 etc.) will also do the job well. A heatsink is recommended even if stage current ist not that high. T1 should be a toroid, a “pig-nose” core in this place to my experience is not the best choice. The 10uH RFCs are ready made ones but you can also wind 20 turns of 0.4mm enameled wire to a FT37-43 toroid core. RF output of this stage could be measured as 100mW into a 50Ω load. This stage has an old 2SC2078 CB transistor and is operated in class “AB” mode. An alternative could be a 2N3553 that is available on ebay for example. A heatsink is neccessary for whatever type you use. Correctly set bias for “AB” operation is ensured by the 1kΩ resistor from VDD to the bias circuit. The 1kΩ resistor limits the current whereas the diode works as a stabilizing element (thermistor). It must be connected directly to the case of the transistor ensuring good thermal contact. If the temperature of the devices rises the resistance of the diode will decrease. Hence current through the diode increases thus reducing the part of the current that can pass through the base-emmiter line of the 2SC2078. Quiescent current is stabilized and thermal runaway is prevented. The rf output is uncommonly terminated with a low-pass-filter. This is because I first intended to build the transceiver for an output level of about 4 watts. But then I had the idea that the space still available on the veroboard could be used by another amplifier definitely leaving the QRP power level. So I left the circuit how it first was and just added the final amplifier stage. Output of this driver stage now ist set to 1 watt into a 50Ω resistor. 2 rf power transistors 2SC1969 by Eleflow provide up to 20 watts of rf power. Bias for such a high power stage can not be set by a simple resistor. Here a line transistor (BD137) serves as current control. Diodes D1 and D2 (1N4002 or equ.) follow the same purpose like the single one in the stage described before. They must be mounted with excellent thermal contact to each of the 2 power devices which ensures secured protection against thermal runaway. The transistors also must be connected to a large heatsink. I use Aluminium metal strips (2mm thickness) to connect them to the back wall of the cabinet. RF is fed into the power transistors via a network of 8.2Ω resistors and two 22uH rf chokes that seperate the rf line from the dc bias line letting only dc pass. This method makes construction of the input transformer easier. Winding ratio is 4 turns primary, 2 turns secondary. This is because the input impedance of the stage ist fairly low (aorund some ohms). The output transformer is a homemade “pig-nose” of 6 toroids FT50-43, where 3 toroids are stacked (using 2-component glue) and 2 of these stacks are glued in parallel (see picture at the end of this text for details!). Winding ratio is 1 + 1 (primary center tapped) to 4 on secondary. Quiescent current of this stage should be set to about 100mA. A low-pass-filter terminates this stage and is connected to the antenna relay. In addition you find a section to measure rf power. This is again the so called “Greinacher-Circuit” which doubles the voltage and serves as a charge pump. The dc output of this circuit directly leads to the S-Meter indicating output power of the transmitter. IMD3 is about 28dB below signal peak which I think is acceptable. Max. radio frequency voltage is 90.4Vpp which calculates to about 20 watts of rf power (P=(Vpp/(2*SQR(2)))²/50Ω). A 12V relay with two pairs of contact sets is the heart of this unit. DC power is lead to TX, RX and permanent supply via the respective power lines. RIT voltage generation is a little bit more complicated. When the RIT switch is in “OFF” position, RIT voltage always is taken from the fixed voltage divider that is formed of the two 4.7k resistors either when on receive or transmit mode. If RIT is “ON” then there are two possibilities: When on receive mode, RIT voltage is gained from the 10k lin. potentiometer in the front panel. When on transmit mode RIT again is taken from the fixed voltage divider. There is also a false polarity protection diode. This can be any silicon type with max. current >= 5 A. “Old school” SSB transceiver for 14MHz by DK7IH (2018) -Inside View – VFO, LO, RX, SSB generator, TX mixer etc. you next challange is to build a rig into a cigerette packet size case. My problem: I don’t smoke, have never smoked and probably never will. 😉 But I have a new transceiver for 20 meters, that might come close to the dimensions of a pack of “cancer sticks”. The transceiver is nearly the same circuit as applied with the “Micro 20-III” but uses a single ended final amplifier instead of a push-pull circuit. I hope to find time the next days to publish an article on this rig featuring full description of the radio. Currently I’m in the IOTA contest and working stations from all over Europe. A compact project: The “Micro42” – Another “shirt pocket” SSB transceiver. Having deferred the work on the “micro multibander” for some time I finished another small QRP rig (this one for 7MHz) that is suitable for my summer excursions by bike or hiking the local mountains here in the State of Rhineland-Palatinate or the Black Forest that is not that far away on the other side of the Rhine valley. The rig uses two mixers NE602 plus one filter as central elements. The signal way is reversed when switching from receive to trasmit mode. This is done by 2 relays and is a well known technique for simple QRP rigs. You will find lots of equivalent ideas on the internet (Example 1, Example 2). But not to ignore the shortcomings of these designs: They are somehow inferior to my requirements, particularly concercing receiver performance. I prefer to have higher signal gain and an AGC circuit. AGC for me is a must. But these designs can be expanded easily, so I added an AGC controlled interfrequency amplifier with dual gate MOSFET BF998 into the receiver’s signal path enhancing performance significantly. The frequency generation of the superhet transceiver scheme is simple: Again I use one interfrequency (i. e. 9MHz). The VFO is DDS based on AD9835 operating below the desired radio frequency, which means that it is set to the range of about 2 MHz. Due to this low frequency you could replace the DDS by a VFO if you don’t like the relatively complex work with the software programming and microcontroller stuff). A 2MHz VFO can also be made very stable, so this is an alternative not to be ignoered. In the center of the schematic you can see the main elements of the circuit: One SSB filter (9MHz), correctly terminated by 2 resistors of 1k each (to ensure proper filter response curve) and two relays with a double set of switches. These relays reverse the way the signal travels through the filter. The advantage of this: You can use the integrated oscillator of the NE612 controlled by a crystal and a tuning capacitor to set the carrier frequency correctly for the lower sideband because the mixer is used as SSB generator and as product detector in common. A word on chosing the proper relays: An intense examination of the relays’ data sheet is essential. I built a prototype of this transceiver on a breadboard prior to soldering the components to a veroboard. I found that some SMD relays have signifikant coupling capacities between the unused relay contacts (in the range of some Picofarads). So stray coupling was a severe problem. Later I used some second-hand Teledyne RF relays that I had purchased via ebay two years ago (price originally 50€!) for 1€ each. These relays are absolutely superb! Before we go: In the circuit scheme above I missed out the antenna switch relay because I think every homebrewer knows what to do in this case. 😉 So the receiver’s signal path starts with a band filter for 7MHz consisting of to tuned LC circuits. The coupling is relatively loose. As coils I use the well known coil formers in TOKO style with 5.5mm outside measure. Coil data for the 7MHz band pass filter (BPF) is 39 turns primary and 9 turns secondary of 0.1 mm enameled wire. The respective capacitor is 33pF. This is a high L to C ratio which gives you excellent LC quality factor. This is mandatory especially when working on the 40 meter band, because of the strong broadcasters starting from 7.200 kHz intermodulation might be a problem when the receiver is connected to a high gain antenna and broadcasters’ signals might overload the first mixer (remember that NE612 has a relatively low IM3!). If you still should have problems coping with too strong out-of-band signals you can reduce the coupler from 4.7pF down to 2.7pF. In practical terms I could not detect any unwanted signal products even when using an antenna with high rf output voltage. One reasons for this is, that there is no rf preamplifier for the receiver. This avoids overloading the first mixer generally. The NE612 has two mixer inputs and two outputs. This makes it very suitable for this sort of radio. In receive mode pin 2 of the right NE612 is used as signal input. VFO signal is fed into pin 6. The resulting mixer products are taken out from pin 4. Next the 9MHz filter follows from right to left. The 9MHz IF signal then is fed into an IF amplifier. This one is equipped with a dual gate MOSFET (BF998), gain is about 15dB when full AGC voltage is applied wich leads to about 6V by the 1:1 volatge divider in the applied to gate 2 of the MOSFET. The left NE612 is the product detector. I use the internal oscillator with a 9MHz crsytal and a tuning capacitor here. This saves building an extra oscillator and simplifies the rig again. One AF low pass filter made of 1k resistor, 100uF rf choke and a 0.1 uF capacitor eliminates high frequency remainders generated by the mixing process. The audio stages are also made simple: One preamplifier (using bipolar transistor in grounded emmitter circuit) and a final stage with LM386 transform the signal to a level that is sufficient to be fed into a small 8 ohm loudspeaker or a set of standrd MP3-player headphones. Because the rig is very small and there was definetely no space for a loudspeaker I use headphones instead. Keep an eye on the power supply switching of the two audio stages. The problem was to eliminate the switching click and pops to a minimum and to avoid acoustic feedback when unsing a loudspeaker. So the audio preamp is only connected to DC on receive. When switching to transmit the charged capacitors avoid instant cut off supplying some Milliseconds DC to the amp until significantly discharged. The main amplfier on the other hand is connected to permanent DC supply. So it won’t pop when switching from tx to rx an vice versa but can cause feedback. To avoid feedback a transistor is used to cut the speaker/earphone from the power amplifier. AGC is audio derived. A two stage amplifier provides a DC voltage analog to the audio input sginal strength. First amplifier stage is a common emitter bipolar transistor supplying sufficient audio voltage. This voltage is rectified by a two diode circuit letting only the positive halfways pass. You can use silicon diodes (1N1418) oder Schottky diodes here. An electrolytic capacitor (100uF/6V) provides the time constant respectively DC decay once the signal has disappeared. Output of the DC stage is split. The collector is connected to 12V via a 4.7k resistors causing a voltage drop when the transitor’s conductivity increases. The emitter is fed to the ADC of the microcontroller (pin ADC1) causing a proportional voltage to the voltage of the applied audio signal so that on the OLED an S-meter can be displayed. An electret microphone picks the operator’s voice. The signal output level of these microphones is high enough to drive the left NE612 (which serves as balanced modulator in this case) directly. Signal input for the mixer should be 200mV RMS according to data sheet. An electret produces about 0.5 to 1 V pp if spoken with a decent voice in the distance of some centimeters. So you have more than enough audio signal power for the modulator. BTW: Carrier suppression of the modulator is excellent. I achieved 56dB without doing anything else! The resulting DSB signal then is fed into the SSB filter, the SSB signal subsequently is directly sent into the right NE612. A band pass filter for 7 MHz eliminates the unwanted mixer products. You should have 400 to 500 mV pp of rf signal here when the transmitter input is fully driven. I recommend a two-tone test generator to check out the linearity of this and the remaining amplifier stages! Next parts of the transmitter are a band pass filter (same coils and capacitors like th rx bandpass filter), a preamplifier and a driver. The later should put out about 150 mW into a 50 ohm load. They are made more linear by emitter degeneration (4.7 and 2.2 ohm resistors for predriver and driver) and negative feedback. This helps to ensure that transmitter performance is fine when IMD3 products are concerned even if the main IMD3 problems usually occur in the final stage. To transfer the rf power into the final stage proper impedance matching is mandatory. Input impedance of the final stage is fairly low (<10ohms), therefore a broadband (down)transformer is used. Data is: Core T37-43, primary 12 turns, secondary 4 turns of 0.4 mm enamled wire. Last stage is a single ended linear amplifier in AB mode equipped with a 2SC1969 rf power transistor by eleflow.com. BIAS circuit: The combination of the 1k resistor, a silicon diode (1N4002 or equ.) and a capacitor sets up the correct bias. Bias is fed into the cold end of the input transformer. Quiescant current should be around 40mA. A good thermal contact between the diode and the transistor is recommended. As the transistor gets warmer the diode will increase its conductivity so reducing bias current. This will prevent thermal runaway effectively! To avoid bulky output transformers the PI-filter (7MHz LPF) is part of the tank circuit of the final amplifier transistor. For this power level this is an acceptable and practical solution because the output impedance of the stage is nearly equivalent to 50 Ohms. A certain mismatch is not a severe problem. DC to the final transistor is applied via an rf choke, for exact data please refer to the schematic! T2 helps to suppress unwanted signals that I encountered when taking the transmitter from the dummy load test environment to a real antenna. I observed unwanted parasetic oscillation in the range of about 1MHz. T2 has a low reactance for this frequency range thus eliminating the oscillations in a reilable way by short circuiting them towards ground. Powered with 12.5V DC the transmitter will put out slightly more than 5 watts PEP. AD9835 is a simple but well performing 10-bit DDS chip made by Analog Devices (AD). It is controlled via 3 SPI lines transmitting the frequency data. Maximum output frequency is around 16MHz when the chip is clocked with its maximum clock rate of 50 MHz. Oscillator output voltage is some hundred millivolts peak-to-peak, so you can connect the output directly to pin 6 of the NE612 mixer. Control signals come from an Arduino Pro Mini board. The microcontroller in this module is, if you are an Arduino user, preinstalled with a bootloader program. I overwrote this small portion of code and use the ATMega168, which is the core of the Arduino, in “native” mode. My software is written in C and transferred via “AVR dude” software using the ISP lines MOSI, MISO, SCK and RESET. These lines are not in the schematic, please refor to ATmega168 data sheet. Alternatively you can use, like shown in the schematic, an ATmega168 controller. So you have to de neccessary wiring on your own. You will find the source code here. I packed it into an Open Document Text File because of problems I encountered when I tried to store the code into this Blogtext. If you need a compiled HEX-file, please feel free to email me! Display is a very small OLED with 64 by 32 pixels. The OLED is, to my point of view, a little bit noisy. To suppress any rf traveling on VDD line I use an 82 ohm resistor and a set of bypass capacitors of 100uF and 0.1uF capacity closely connected to the OLED VDD pin to GND. A low pass filter by the output of the DDS ensures spectral purity and avoids clock oscillator feed through. Remember that if you need another output frequency other than 2 MHz you should redesign the low pass filter. Tuning is done by a rotary encoder connected to PD5 and PD6 of the microcontroller. I use the pull up resistors internal to the microcontroller, so you won’t see any other things than the mere encoder. Tunings steps are selected by pushing the encoder knob or another suitable push button. This button is connected to ADC0 in the ATMega168 via a 3.9k resistor. The resulting ADC voltage might be problem because of a certain variation in the values of the pull up resistors that form the second resistor of the voltage divider. There is an outcommented section in the code that will show you the exact ADC value that has to be typed into the code so that key recognition works exactly. The button once pushed will increase the tuning step by a certain amount of Hz. Steps are 10, 50, 100 (standard step), 250, 500, 1000 and 5000 Hz in and endlessly revolving chain. The step will be reset to 100Hz (standard tuning step) by leaving the tuning knob idle for 2 seconds. That’s all with the controls. Very simple, but sufficient. Wiring can be made by using the colored lines stripped from old parallel printer cables. These cables have a diameter of precisely 1mm an fit through the holes of the veroboard excactly. If you connect any external components that are not on the same veroboard use standard 2.54 mm (0.1″) male and female board connectors! This will make it much easier to dismantle and reassemble the rig in case troubleshooting is neccessary. Use M2 srews instaed of M3 when building very small rigs like this one! Two brass made bends (from the local hardware store and each cut to a length of 8 centimeters) hold the PCB inside the mounting frame. A winding has been cut into the brass to fix the bends with screws in M2. 73 and thanks for watching! On the picture the board is not equipped with the neccessary wiring yet to give the reader more sight on the single circuits. Next I will draw a schematic of each board to point out the used circuitry for those who want to build this or a similar receiver. First test are promising so far, the receiver is sensitive, has a very low noise figure (due to dual gate MOSFETs in the preamp and the two main IF amp stages) and has shown no problems to cope with high out-of-band broadcaster signals on the 40 meter band which is due to the SBL-3 mixer I have used that has a good IM3 performance.. In the last entry about my new project, a micro multibander for QRP SSB HF use, I referred on the circuits of the Si5351 VFO, the microcontroller, OLED module an the other digital circuits controlling the transceiver. This is the practical side, now: All the digital circuits are placed behind the front panel. This is for practical (to save space in the main cabinet) and electronic reasons. By keeping the digital leads as short as possible you make it is easier avoiding hum, noise and other unwanted radio signals penetrating into your analog circuits, mainly the reciever. This is the module taken from the side. All electronic stuff is mounted onto a 8cm x 6cm double sided veroboard. I use M2 spacers of various lengths to keep the “subboards” in place, like the Si5351 breakout, that you can see in the middle of the picture. These spacers are available from Chinese vendors on ebay and help a lot to build very compact electronic stuff. All joints and bolts are kept in M2, too. The module is finished with a 1.5mm aluminium board where the plugs for the connectors are fed through. These connectors will be equipped with home-made plugs (1″ technology) and then connected to the respective parts of the analog circuits like receiver or transmitter. Here is another view of the lateral arrangement: The old-style S-meter stripped from an old HANDIC-brand CB radio was purchased on ebay for a few Euros. There ist still a lot of old CB stuff there, giving enthusiast homebrewers a large stock in interesting electronic and radio-related material. This project tries a new personal approach in designing a very small (i. e. a micro) QRP radio. And also new is the way I want to report about it. The blog entries will be published more or less simultanously to the building progress of the respective modules. The main objective is to set up a SSB QRP transceiver for 6 HF bands (similar to my 5-bander introduced in 2015) now starting with 160m, then 80m, 40m, 20m, 15m and 10m at last. Another idea I have in mind is to build the rig from separate modules for each single stage so that each main circuit (mainly receiver and transmitter section) is constructed with the needed stages on verobaords that are mechanically identical. The idea behind that is that a board which does not show top performance in function (or even completely fails) can be changed quickly and an improved version can be installed easily without the need to throw the whole receiver (for example) into the junk box labelled with “failed projects”. Band switching will be done by small relays again (I purchased 60 SMD relays for 40€ some months ago). The band filter section will be shared by tx and rx section this time. This saves space and reduces effort. The transmitter will be a 4 stage unit again (more or less the same like in my 5 bander). Output power projected is 5 to 10 watts on all the bands. The receiver is designed once again as a single conversion superhet because experiments with double conversion were not successful due to a large number of spurs audible in the receiver. The first mixer is set to be an SBL-3 diode ring mixer. This will give the receiver a very good handling of strong signals, I hope. IF amplifier will be a two staged one with dual gate mosfets controlled by an audio derived AGV voltage. The rest? The usual suspects, I would say. Wait and see! I have become quite familiar with SiLab’s Si5351 oscillator module the recent months. I first used it in my “Micro 20-3” trx which was a success. The module is very small, completely ready for use (I’m still using a breakout board made by Adafruit) and able to handle 5V. It provides 3 oscillators that can be programmed independently to put out something lieke a square wave ranging from 8kHz to 160MHz. I have developed a software that avoids any tuning noise, so, this oscillator (which is a clock oscillator by intention) can be used as a VFO for an amateur project. To keep the effort simple, I reused the 1306 oled module that you can see in lots of my previous projects. Both boards (Si5351 and 1306 oled) are controlled by I²C-bus which allowes me to use a relatively simple micro controller. In this case again I have the Arduino Pro Mini containing an ATMega168 controller (16 MHz) on board. If it should turn out that I might need more memory, the same board here is on stock carrying an ATmega328 controller. Let’s see how this will work out. The module will be placed behind the front panel. Tuning will be done by a Bourns optical encoder that turns very smoothely. I purchased some for under 5 Euros each from pollin.de. An unbeatable price! Unfortunatley they have been quickly sold out. The core of this module is the Arduino Pro Mini microcontroller centered on the diagram. It is connected to the Si5351 breakout board and the 1306 oled display by I²C bus. Si5351: Output 0 is used as VFO terminal and output 1 carries the LO signal with 9Mhz. To avoid digital noise spreading on the +5V line a 100µF capacitor should be switched close to the VDD terminal. Proper and short grounding also is recommended to avoid spurs. OLED1306: Also a 100µF electrolytic capacitor has been added including a 10µH rf choke forming a low pass filter together. I found that these oleds a very prone to distribute digital noise via VVD line, so this measure contributes much to keep your receiver clean from any unwanted signal spektrum generated by the oled. Keep in mind to tie SCK and SDA lines to +5V via two resistors of 4.7kOhms each! Band switching: It is software controlled. To save output ports I did not connect the 6 relay drivers for the 6 bands directly to the ports of the microcontroller. I’m using an open collector BCD to DEC driver (74LS145) instead. Ports PB0, PB1 and PB2 are forming a 3-bit pattern that is switched to 6 output lines (output 0 to output 5) of the BCD2DEC driver IC. 74LS145 is capable of handling switch voltages up to 15V thus working with 12V coil relays is easy. User control interface: This rig has 4 different switches that will be explained later from the functional point of view. The operator can set nearly all functions of the transceiver by using these push buttons and the main tuning wheel. The buttons switch to GND by 4 different resistors and are read by PC0 port of the micro. PC0 equivalents to channel 0 of the integrated analog-to-digital converter (ADC) inside the ATMega168. This also saves controller ports to a large extent (using 3 instead of 6 ports!). So, all in all, I think I can dare controlling a multibander by a relatively small microcontroller.